Well, there was only ever going to be one contender for our coveted ‘Video Of The Week’ accolade, when German industrial metal giants Rammstein dropped their epic new offering, ‘Deutschland’, a couple of days back (well, there was another clip in close contention, but we’ll come back to that…). It has been ten (very) long years since the Teutonic titans dropped some new music our way, and when it was revealed that there was some coming our way everyone – and I mean EVERYONE – knew it was going to be something special. 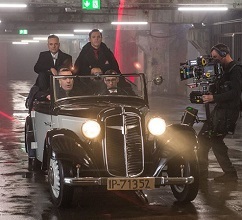 After all, a new Rammstein video is an event in its own right… but, with ‘Deutschland’ they have taken things to the next level, with a nine-minute-plus epic worthy of the finest Hollywood productions! I swear, I was looking for Steven Spielberg’s name in the credits! A mini-movie in its own right, with ground-breaking production values for a music video, it truly is a majestic masterpiece, combining all of Rammstein’s trademark musical elements, with the archetypal arrogance and bombast for which they are renowned, with their usual tongue-in-cheek twist-of-the-knife – and not a touch of controversy. These latter qualities are exemplified by the fact that, despite the fiercely nationalistic connotations of the song’s title, the lead character of the spirit of Germania is actually portrayed by a black actress. OK, we mentioned that there had been another contender for this week’s video slot… coincidentally, it was released on the same day, and is (sort of) thematically linked, at least visually.